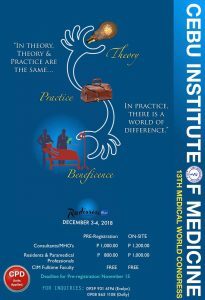 The Cebu Institute of Medicine, once again, hosts its annual medical world congress on December 3-4, 2018, at Radissson Blu Hotel. For details of the program you can download it here. See you! CIM makes indelible marks during APMC Regionals in Dumaguete!